I agree with this statement wholeheartedly. Passionate love only lasts so long--it is the slogging through after the head-over-heals, feet never touching the ground ground feelings wear off that matters. Yes, "the slings & arrows of outrageous fortune" don't go away & how a couple deals with them together makes all the difference. Having the core of a deep friendship can make even the most difficult circumstances bearable. And true love is built on real friendship over time. Having been through one failed marriage, I've come to the conclusion that my ex & I were at our best as friends. And at one time we were friends but I think we fooled ourselves into thinking that there was enough commonality in values, hobbies, interests to sustain us. There just wasn't. Xing Fu & I joke about the one dating rule that we adhere to: "Never date a non-sailor." We both did not follow that rule the first go 'round & look where it got us...We joke but I think there is a truth there. We met doing what we love--there isn't a day that goes by that sailing isn't mentioned. In fact, our house could be described as a shrine to sailing. Sad, but true. All of our sailing friends love it... But, that is our passion. I feel my happiest & most alive when I'm out there & what better than to share that with someone I love & who understands my need to be trimming the kite. But this isn't a blog about sailing, really...ha! Who'm I kidding?? My point in all of this is that common interests, ahem, obsessions, (joking) are extremely important. I look at other sailing couples in our social circle & being out on the bay together seems to be very satisfying for them as well. I know that when I was out in the dating scene, I decided to dive back into the sailing community for a big reason--I loved sailing & I really wanted to be with someone else who loved it as well (and my other passion of horseback riding has, like, zero men). As I've talked about in much earlier posts, even if I didn't meet anyone, I was loving my hobby, er, obsession. I also want to point out that even though sailing was what drew us together, that wasn't the only thing about our original friendship. Actually, it was The Who. At least, that's what got us talking in the first place. And our common interests are very important--we enjoy doing things together & building on the basis of our friendship. 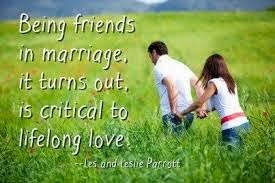 I think good marriages & LTRs are bound together by just enjoying being with your best friend. Below is a little quiz thingy I found about knowing your spouse/significant other. Have you lost touch with these things? Yeah, some of them seem trivial but when I thought about it, I realized that these are the dailys--and adapt as needed--if your partner doesn't like movies that much, how about favorite books. If you have lost touch--use this as a way to jump off & reach back out to reconnect. I can name my partner's best friends. I know what stresses my partner currently faces. I know some of my partner's life dreams. I am very familiar with my partner's religious beliefs. I can outline my partner's basic philosophy of life. I can list the relatives my partner likes least. I know my partner's favorite music. I can list my partner's favorite three movies. I know the most stressful thing that happened to my partner in childhood. I can list my partner's major aspirations. I know what my partner would do if he/she won a million dollars. I can relate in detail my first impressions of my partner. I ask my partner about his/her world periodically. I feel my partner knows me fairly well.